I was waiting at lights on the way home. Noticed that the ODO was showing 4442x. 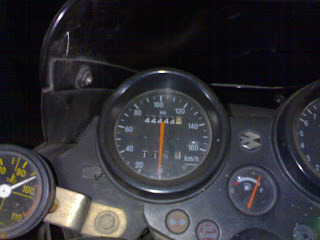 I was quickly going to cross over 44444 on ODO. Watching such digits roll over on digital watches and ODOs is something that I like. It was 20+ kilometers to go before I could watch the roll over happen and I was going to miss it if it happens en route. "Wish I could see it happening", I said so to myself and rolled on and forgot it as I ripped on the Eastern Express Highway towards home. When I entered the lot and looked at ODO, it was exactly 44444!!! !